NOTE: Now reordered with latest post on top. On Tuesday, June 26, I said goodbye to my house and my neighbors and started my life as a Rockrimmon refugee. My heart was pounding as I made one last sweep through our little house in Raven Hills. I wondered if my family would ever celebrate another birthday here. I paused at the window where we saw so much wildlife in the woods outside. Where we always put up our Christmas tree. The Flying W Ranch in Colorado Springs wasn’t just a tourist attraction. It was part of the Pikes Peak region’s history. And on Tuesday, it burned to the ground in a brewing wildfire that went wild. "It’s a sad day for the Flying W Ranch," the ranch management said on its website. 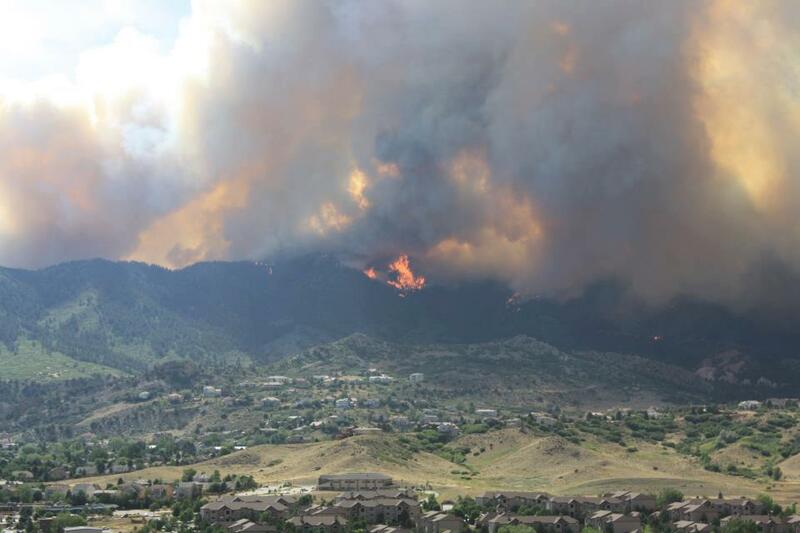 Waldo Canyon Fire Part 4 - A view of the fire from the Hunters Point neighborhood as it hit Mountain Shadows on 6/26. 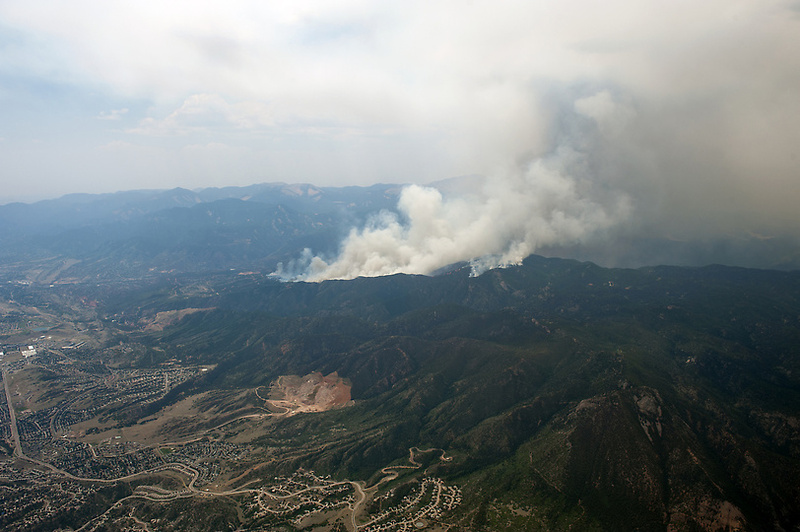 Waldo Canyon Fire Part 3 - A view of the fire from the Hunters Point neighborhood as it hit Mountain Shadows on 6/26. In an effort to reduce the footprint of cadets on the Air Force Academy and focus on the Class of 2016, Academy officials are relocating approximately 550 cadets off of Academy grounds. Approximately 200 summer academics cadets will be temporarily relocated to the University of Colorado, Colorado Springs campus tonight in an effort to continue the mission of developing leaders of character for the United States Air Force and our nation. "UCCS has been a terrific partner helping our faculty and cadets continue our academic programs while we focus on the Class of 2016 and in-processing," said Brig. Gen. Dana Born, dean of faculty. Commanders have suspended the airmanship program due to the current operational support of the Waldo Canyon Fire, and other training programs have also been postponed. These approximately 350 cadets have been released to their local sponsor families. Academy officials want to ensure the public that the cadet area is currently not in imminent danger. Class of 2016 in-processing will occur as scheduled Thursday on the Air Force Academy. Mission-essential personnel and all those supporting in-processing should report for duty as scheduled. All other base operations will be closed. All medical appointments are cancelled through Friday. Patients will be contacted to reschedule appointments. 10:15 pm - Army engineers from Fort Carson who were working on building fire breaks along Highway 24 have shifted their resources to the Air Force Academy. The Academy asked the Army for aid in building fire breaks around the school's boundaries. The Army has committed 121 troops to helping the Academy, along with with 10 heavy bulldozers, four excavators, two wreckers, two flatbed trucks, two fuel trucks, 13 military transportation and support vehicles and a commercial road grader. An Army spokesman said in a statement that Fort Carson is prepared to devote as much of its resources as possible to fighting the fire. 9:35 pm - As of 9:20 p.m., the fire now covers 18,500 acres, and has cost $3.2 million. There are 1,008 personnel on scene, and 68 fire engines. Fire fighters from as far away as Iowa and Indiana are helping battle the blaze. There are six helicopters on scene--two Type 1, two Type 2, and two Type 3. Fire fighters have three bulldozers to help build fire lines, and three water tenders. No more residents have been evacuated, and no more evacuation orders have been issued for any neighborhoods or towns. However, 20,085 homes and 160 commercial properties are threatened by the flames. The fire now covers 15,622 acres of US Forest Service land, 2,866 acres of private property and 12 acres owned by the Department of Defense. Where did the fire go last night? Matt zooms in and finds out given the Wednesday morning official fire outline. Brian Fox figured his house was gone when he saw a photo of his block in flames. On Wednesday, a police officer confirmed that it had burned to the ground. "We’ve lived there for 15 years and put blood, sweat and tears into it", he said. "A house is just a box that holds a bunch of things. But it’s been our home. That’s the hardest part. Losing your home." 6:19 p.m. - A firefighter told reporter Ryan Maye Handy today that during a briefing, crews learned that 200 to 300 homes have been lost. He said it was difficult to be accurate about the number, since the devastation is so complete that you can't even make out addresses. 5:45 p.m. - A new Incident Information Report gives the numbers: 15,517 acres burned, 20,085 residences and 160 commercial structures threatened, 32,000 evacuated. Read the report at http://inciweb.org/incident/article/14523. 5:34 p.m. - County and state officials described a bleak, apocaplytpic scene inside the fire-torn area on the city's northwest side. Iit’s like a war zone, if you will. said Steve Cox, the mayor's chief of economic vitality and innovation. Amy Lathen, chair of the El Paso County Board of County Commissioners, described the devasastion as surreal. Entire blocks gone, she said. She and commissioner Sallie Clark were taken on a tour of the burned-out neighborhoods by Fire Marshal Scott Campbell. Halfway along their tour, Campbell noticed barkchips beginning to ignite in front of a house that escaped unscathed the night before. Campbell jumped out of the truck and began digging soil onto the smoking pieces of bark. After a few minutes, more smoke appeared on the side of the house. He managed to put out both blazes with a garden hose. It blew up," said Lathen, who credited Campbell with saving two houses. "The winds are so strong that they're knocking over tree branches," Lathen said. Cars are burned out, and chimney stacks are all that is left of some houses. VANDENBERG AIR FORCE BASE, Calif. Air Force Space Command deployed the only Department of Defense wildland fire fighting asset from Vandenberg at 2 p.m. June 27 in support of the wildland fire fighting efforts in Colorado Springs. The 18-member Vandenberg Hot Shot crew, along with two hot shots crew carrier vehicles, one superintendant support vehicle and one all terrain vehicle, loaded into the belly of a C-17 Globemaster from March Air Reserve Base at approximately 1 p.m. on June 27. "This is national support at its finest," said Mark Farias, Vandenberg Fire Department chief. "Vandenberg Hot Shots, being the only DoD hot shots, bring a critical skill set to the fight. These guys will be on the front lines of this wildfire using their training regarding wildfires and urban interface to save lives and structures in the state of Colorado." 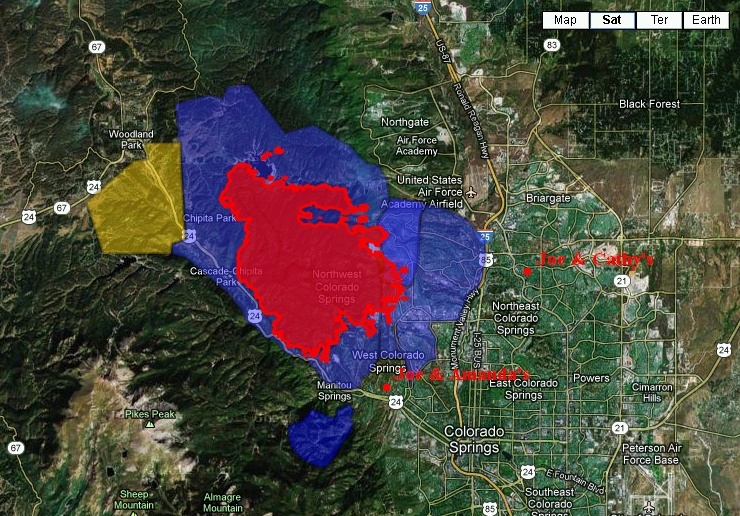 The hot shots will most likely be assigned to the Waldo Canyon Fire. 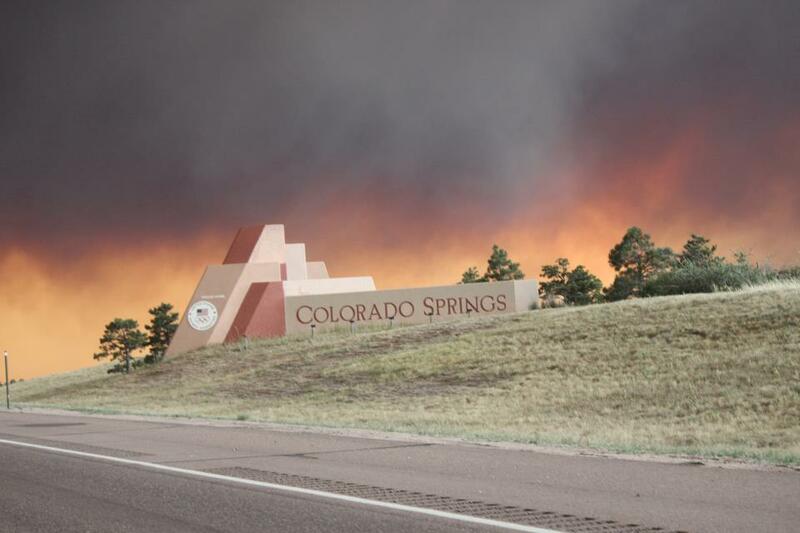 As that fire rages in Colorado Springs, engulfing more than 15,517 acres, many military bases and residential areas are in danger and facing mandatory evacuation. This hot shots crew has been explicitly trained to save structures, not just to extinguish the flames. "When a building or community faces a wild fire danger we use structure triage," said Jesse Hendricks, Vandenberg Hot Shots superintendent. "First we remove any fuel source, like trees or shrubbery, from around the home using hand tools. Once we've created an area clear of fuels, we actually burn a fire around the structure that will carry the initial fire away from the homes." Vandenberg's Hot Shots are going into this inferno mentally and physically prepared. "We all got into the mindset that this is going to be a nasty situation," Hendricks said. "We understand fatigue will be a factor, so we are all hydrating and are trying to get as much sleep as we can before getting to Colorado. When we go into any wildfire we try to relate it to our 'mental slides,' meaning that we recall similar wildfires and pull from those lessons learned so that we will be more effective." Vandenberg's Fire Chief feels confident that this hot shot crew will prove to be a valuable asset to the containment of the Colorado wildfire. 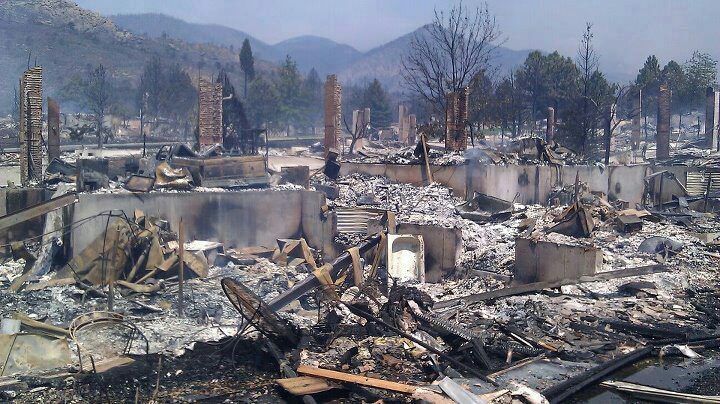 "Thousands of people and homes are threatened, but the most skilled DoD wildland fire fighters are being deployed. 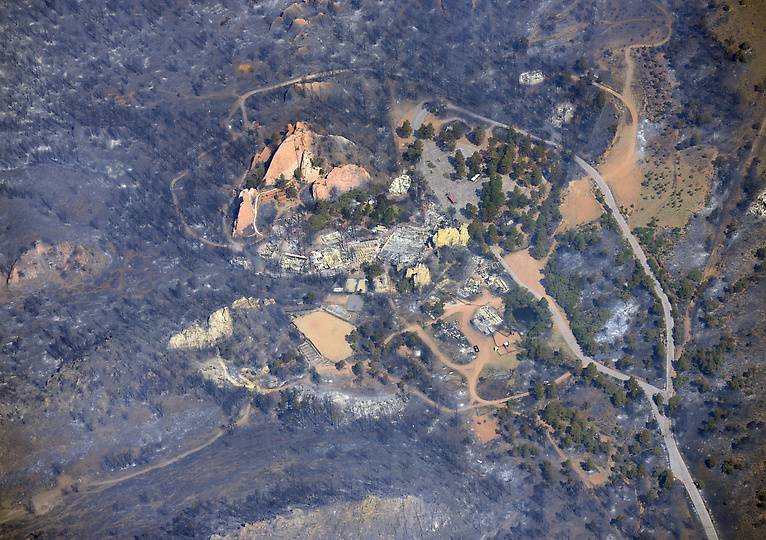 Our hot shots are difference makers, having saved this base numerous times, our surrounding communities and now Colorado Springs," Farias said. "We are working with the military. This is a unified team." They are still sticking with this morning's measure of 15,324 acres burned. He is looking at the property assessment issue. "We started that assessment today. I don't have any numbers for you today." They are trying to create a process for citizens to get information on their homes. "Our intent is that we will have a meeting with those folks." We would ask that media would respect that process." "In the next 24 hours, we hope to have a little more definitive information on numbers of people impacted, and also on the process itself." "The conditions are exactly what we predicted. They are erratic." There is quite a bit of activity going on. 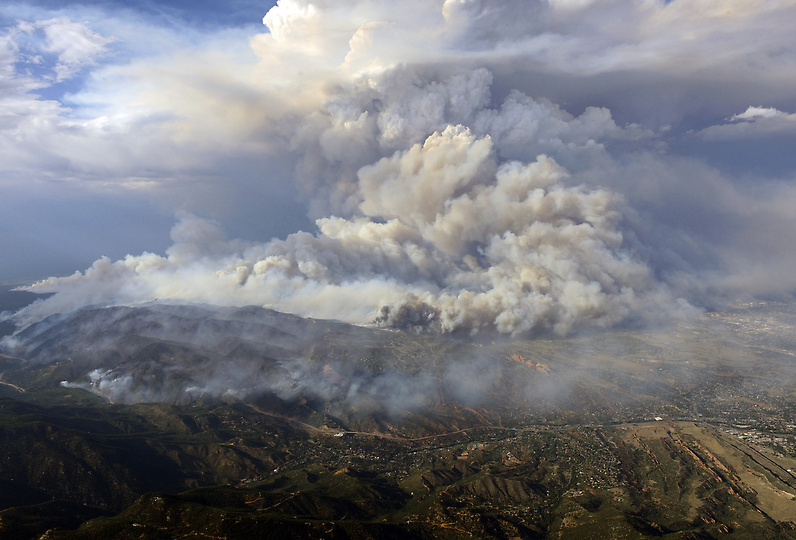 "We are fighting these fires very, very aggressively, yet very safely." Firefighters are trying to put out burning embers and hot spots. "This is still an active fire. We have the firefight and the overhaul. We're nowhere near the overhaul." Firefighters are checking for fires and structural stability, and trying to save structures. They're also taking care of open gas mains. "But it's not a safe area for anyone to be there right now." About 70 law enforcement officers are patrolling around the affected area. Other departments helping out include Fountain, El Paso County Sheriff's Office, the DEA, the FBI, Aurora PD, Pueblo PD, ATF and Colo State Patrol. "I'd like to start by saying, I hate wind. I wish it would go away." We were able to make good progress and hold along Highway 24. We've been pounding it from the air with the heavy helipcopters. Fire is in Sand Gulch area, and "we're a little ahead of that." Crews taking brush out. They're holding along Rampart Road near the reservoir. A spot fire is threatening a repeater site at Stanley. "We're concerned about that. We have a helicopter working it." Another concern: "Winds are pushing fire back toward Colorado Springs back where it hit us yesterday." But crews are on it. Spot fires and embers are creating secondary fires. There is a specially trained meterologist on site. Harvey said weather conditions are better today than yesterday, with more cloud cover and slightly higher humidity, but not enough to make a difference. Today, however, crews are more prepared for the possibility of rapidly moving flames. "We were prepared for it yesterday, but it moved astronomically fast," Harvey said. "You can fool us once, but not twice. Today, we are prepared for it to move astronomically fast." Harvey also said this fire is one for the history books. It's been going in different directions, and it's spread fast. "I've been doing this for a long time, and I've never seen a (fire) progression map look like that," he said. 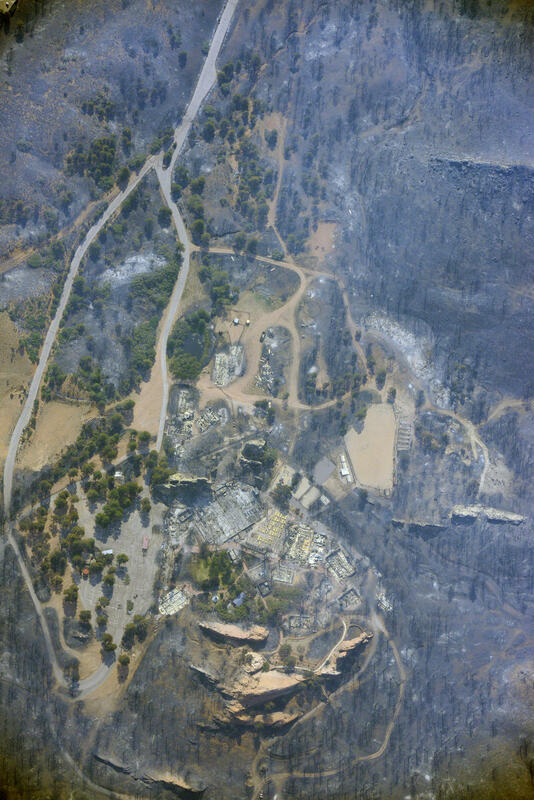 Flying W Ranch burned down!!!! 3:26 p.m. - A form on a website has been set up for evacuated residents who are concerned about the status of their home or business. "Your information will be collected and you will be contacted as soon as information is available," the press release says. "Many affected areas are too dangerous for assessment teams to enter, but as they are able to do initial damage assessments of affected areas you will be contacted." 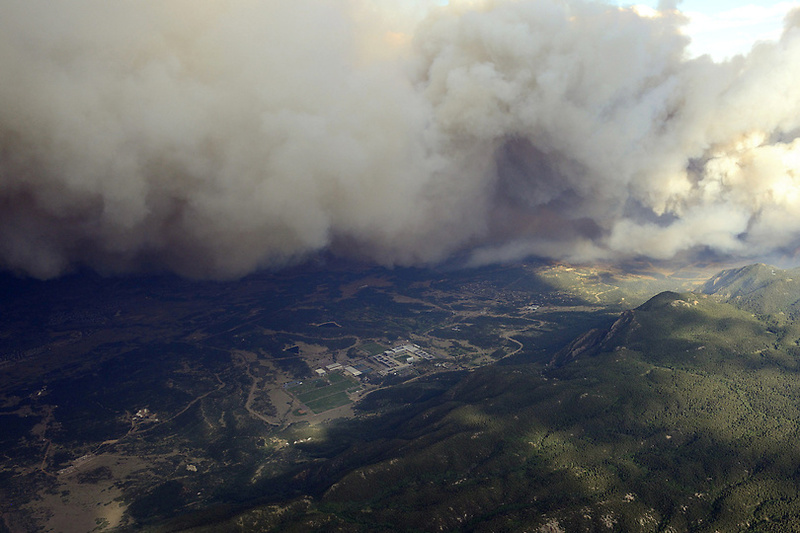 3:18 p.m. - Agents with the Federal Bureau of Investigation are helping El Paso County authorities in trying to figure out what started the Waldo Canyon fire, an FBI spokesman confirmed Wednesday to The Denver Post. 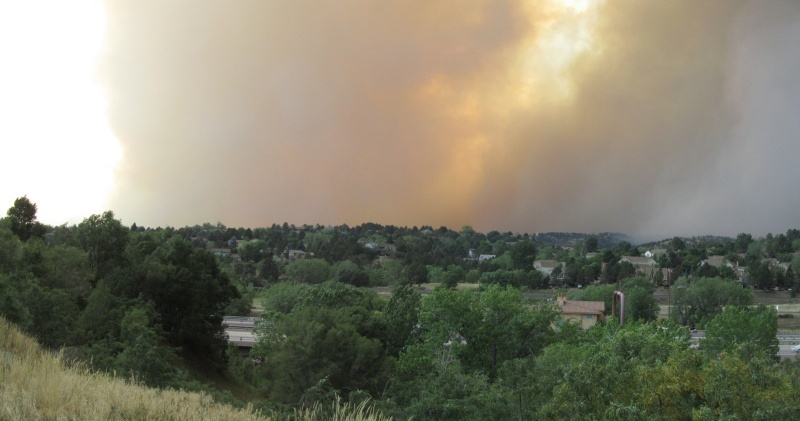 The FBI Denver Division is working closely with local, state, and federal law enforcement to determine if any of the wildland fires resulted from criminal activity, local FBI spokesman Dave Joly wrote in an e-mailed statement. 14:30 MDT - Fire and weather conditions have let up enough to allow residents of the Douglass Valley housing area on the Air Force Academy to re-enter their homes between 3:30 and 5:30 Wednesday so they can grab any items they need. Pine Valley housing remains unsafe for re-entry. 14:28 MDT - Three C-130s are now flying on the Waldo Canyon fire. The fourth will be back soon. As of 2:15 p.m. Wednesday, C-130s had dropped 27,000 gallons of retardant in 10 drops. 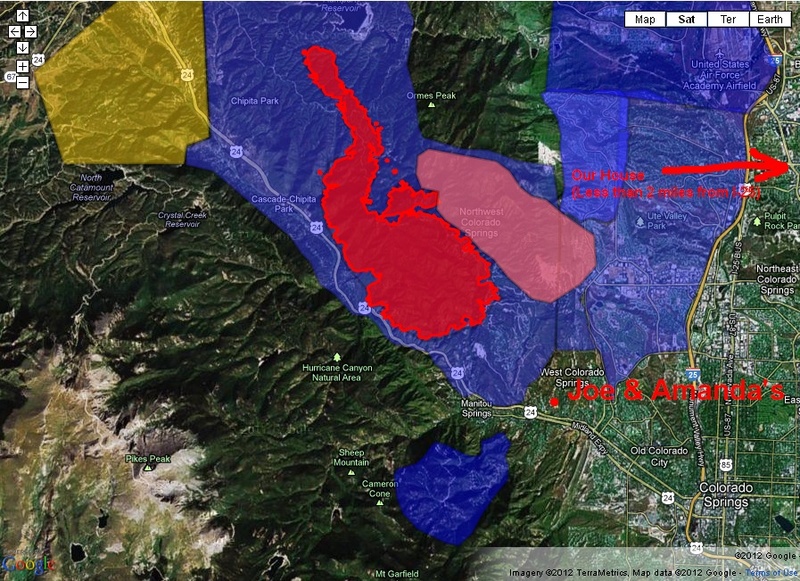 The remainder of the City of Woodland Park city limits that have not been previously evacuated. All areas East of CR25 (a.k.a. Tranquil Acres Road and Mocks) to Blossom Road, including the subdivision of Tranquil Acres, North to the intersection of Forest Service Roads 357 and 357b, North on FSR 357 to CR 78 (a.k.a. Painted Rocks Road), North to the Douglas County Line. 14:11 MDT -	Authorities said on Wednesday afternoon that the growing number of evacuations and pre-evacuations aren’t keeping them from keeping watch over the thousands of houses that already sit vacant. Officers with several out-of-town agencies, including the Pueblo County Sheriff’s Office and the Colorado Department of Corrections, have been sent in to man road closure points and to patrol the evacuated areas on the lookout for looters. There have been no reports of break-ins since the first evacuations were ordered on Saturday, said Anne Rys-Sikora, a spokeswoman for fire and emergency crews. There is a concern and it is being addressed, Rys-Sikora said. Clearly, we are not doing this alone. 11:39 a.m. Tweets from Gazette's Matt Steiner: Woodland Park mayor says evacuations will begin of formerly announced "pre-evacuation areas." Others will be on standby. Everything west of Baldwin/Rampart Range Road, portions west of Highway 24 and south of downtown will be on mandatory evacuation. 11:18 a.m. Some at Garden of the Gods Road and Centennial Boulevard were scoping out their neighborhoods Wednesday morning, checking to see if ther houses still stand. "The deck's fine, the chicken coop is fine. All the trees are fine," Ken Barker, who lives on Lanagan Street, said while on the phone with his wife, who was back in a hotel. He continued the grim assessment over the phone: At leat three houses on that street that he could once see were gone. He later pointed to a dark spot on the south part of the ridge. "That was a house and it's completely gone," Barker said. "My house is still standing," he said. "I'm pretty happy right now." 10:52 a.m. Woodland Park city manager David Buttery will give a live fire update via the Internet and local cable Wednesday at 11:30 a.m. The broadcast will be streamed live at city-woodlandpark.org and on Woodland Park cable channel 10. 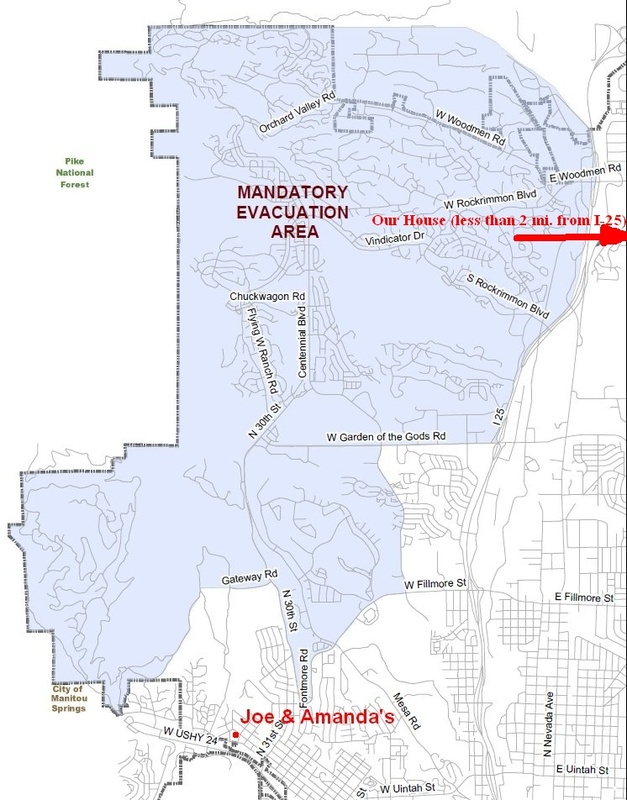 9:56 a.m. As if firefighters and residents didn't have enough to deal, forecasters have issued a flash flood warning for Wednesday for the area of the Waldo Canyon fire. The National Weather Service in Pueblo has issued a flash flood watch for El Paso and Teller counties, specifically the newly burned areas. Forecasters say a cold front, which could trigger thunderstorms, is expected to move into the area Wednesday afternoon. The moisture would be welcome, but with little vegetation left in the hills above Manitou Springs and Old Colorado City, forecasters warn flash flooding could occur in those areas. 9:37 a.m. Douglas Regional 9-1-1 has issued a pre-evacuation warning: "The Waldo Canyon fire burning in El Paso County is expanding and poses a threat to residents of southwestern Douglas County. The specific area included in this pre-evacuation warning is bounded by the Palmer Divide Road on the south, Noe Road on the north, Spruce Mountain on the east, and Rampart Range Rd.on the west. "Residents in the affected area need to make immediate plans for the evacuation and care of family members and animals. The Douglas County Fairgrounds in Castle Rock can accommodate evacuees and large animals should an evacuation become necessary. Residents are urged to gather important documents, medications, and important personal effects so that they will be immediately available should conditions deteriorate." 09:00 MDT. 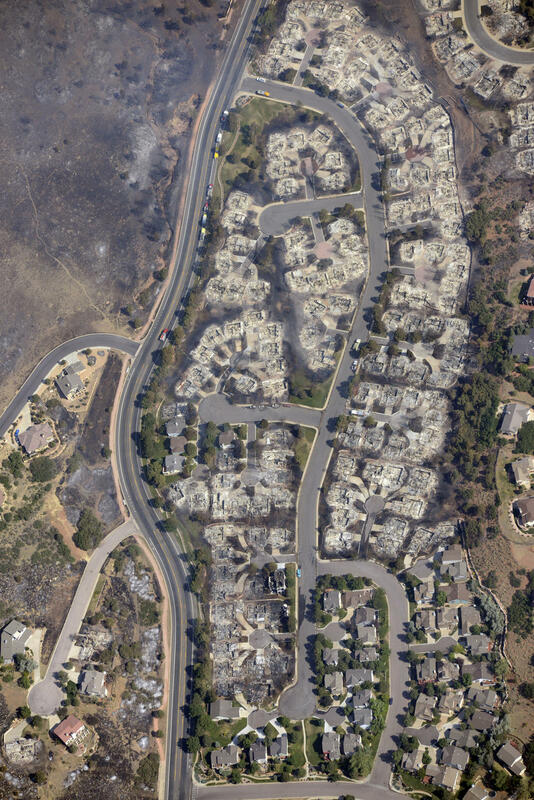 At least 100 homes, likely more, were burned when the Waldo Canyon fire roared into the Mountain Shadows neighborhood Tuesday, according to an official who declined to be named Wednesday morning. 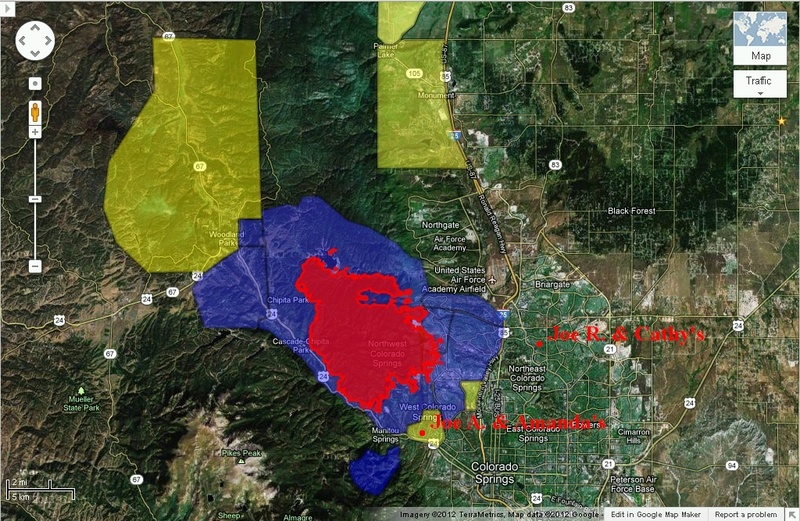 8:21 MDT From morning media briefing: The Waldo Canyon fire has exploded in size, growing to 15,324 acres. On Tuesday, the fire jumped two containment lines and raced into the Mountain Shadows neighborhood, where many homes were destroyed. 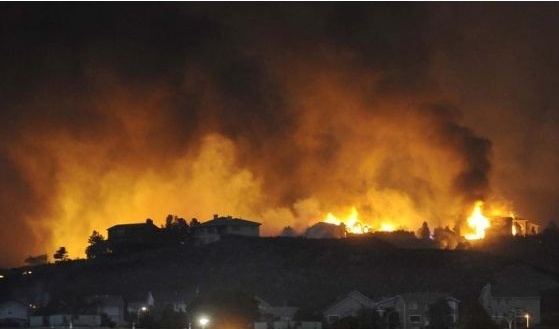 At the briefing, Colorado Springs Fire Chief Richard Brown said he was not prepared to say how many homes had burned. "We don't know the number of homes lost," he said. Crews had been battling the blaze "all night long," he said. "This is not a defensive situation by any means," he said. 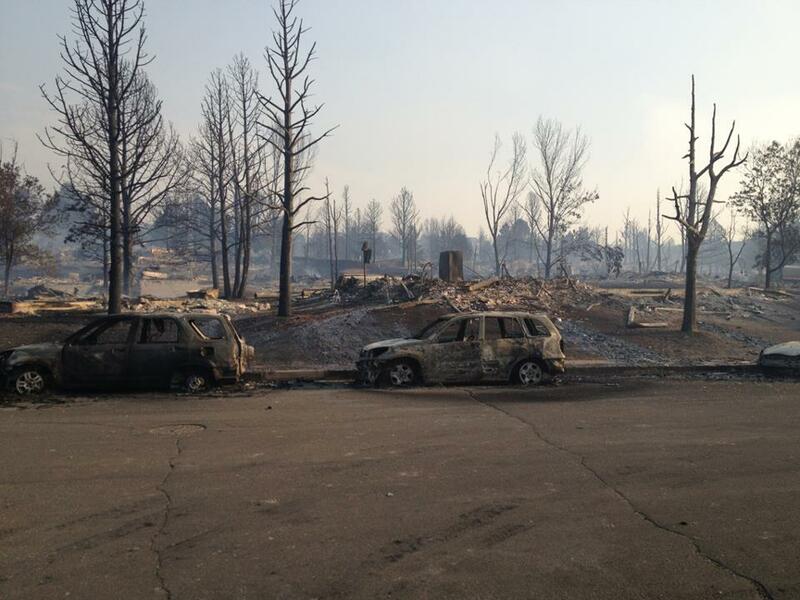 Two-hundred more firefighters were brought in Tuesday night to battle the spreading fire. "We've had way more successes than we have failures," said Jerri Marr, forest supervisor. The cause of the fire, she said, remains unknown. A tip line seeking leads from the public has been flooded with calls. There is no "person of interest." Officials said there have been no reports of injuries and they are not aware of anyone not accounted for. The fire remains only 5 percent contained. "This is a very difficult time for our city, but we will get through this together," Colorado Springs Mayor Steve Bach said. He saluted those police officers who helped thousands flee the blaze Tuesday night. More than 32,000 people have been evacuated. No new evacuation orders were issued Wednesday morning. Wednesday looks to be another tough day for firefighters. "We do expect all of our lines to be challenged today," incident commander Richard Harvey said of the chance for erratic winds from thunderstorms. Jill Law of El Paso County Public Health, meanwhile, warned the public that air quality remains unhealthy and advised people to stay indoors if possible. Colorado Springs Utilities officials were on hand to assure that water quality has not been compromised because of the fire. Gas service has been cut off to evacuated areas. Highway 24 remains closed between Cave of the Winds and Crystola. The fire line there has held, officials said. A spot fire did erupt on the south side of the highway, but was quickly put out. Blowing embers, which can travel more than a half-mile, are a major concern; 65 percent of embers are starting fires, officials said. From the Rocky Mountain Area Coordination Center: "Significant growth is anticipated with active fire behavior expected overnight." Wind is from the north-northwest according to fire officials on the scanner, pushing fire toward more homes in the city. All Colorado Springs hotels appear to be booked, according to desk clerks at a dozen area hotels. 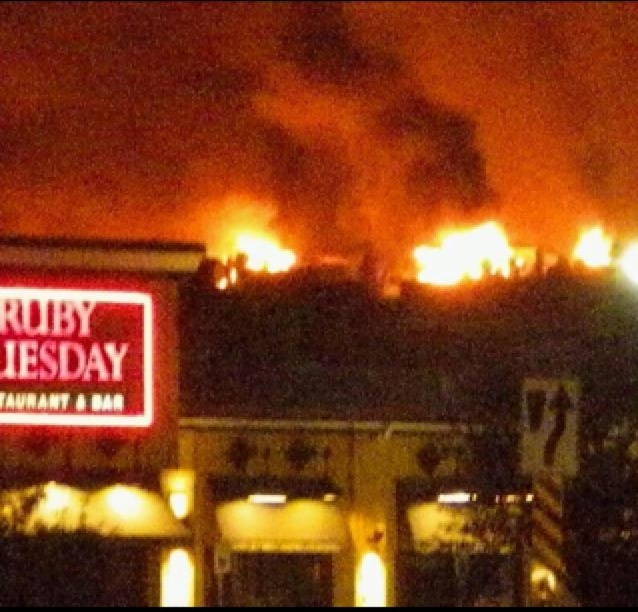 South Denver Marriott said there may not be a hotel room in Denver available, due to the Waldo Canyon Fire and a big softball tournament. On casualties, El Paso County Sheriff Terry Maketa said deputies "haven't heard of any or heard of any suspected." El Paso County Sheriff Terry Maketa says the fire remains "very active" west of Centennial from Flying W. Ranch to just past Vindicator. The Antler's Hilton, 4 S. Cascade Ave., is opening up a ballroom for evacuees. All of their actual rooms are full. Hotel employees say the ballroom can fit about 50 to 60 people and, while they have some blankets, it would help for evacuees to bring sleeping bags. About 11:15 p.m. they had less than 10 people there. Traveler's tonight should be warned that all exits onto west-bound highways from from Academy to Uintah are closed, according to the Colorado Department of Transportation. Interstate 25 was re-opened earlier tonight. Southbound Interstate 25 has been reopened through Colorado Springs, city spokeswoman Julie Smith said at 10:15 p.m.
Holland Park is now under a mandatory evacuation order. The fire has grown to 6,200 acres, and remains 5% contained. 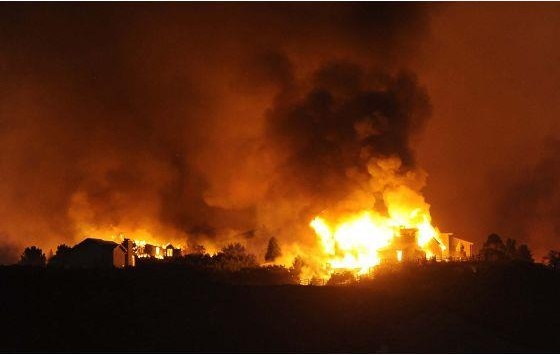 According to inciweb.org, 20,085 residences and 160 commercial structures are threatened. More than 750 firefighters are working the fire. From Facebook: gazette.com - From The Gazette's Ryan Handy: Chief Brown said, "Been on the job for 32 years. This is biggest thing I have ever been involved in, hands down." Official says it will be days until we know what was lost. 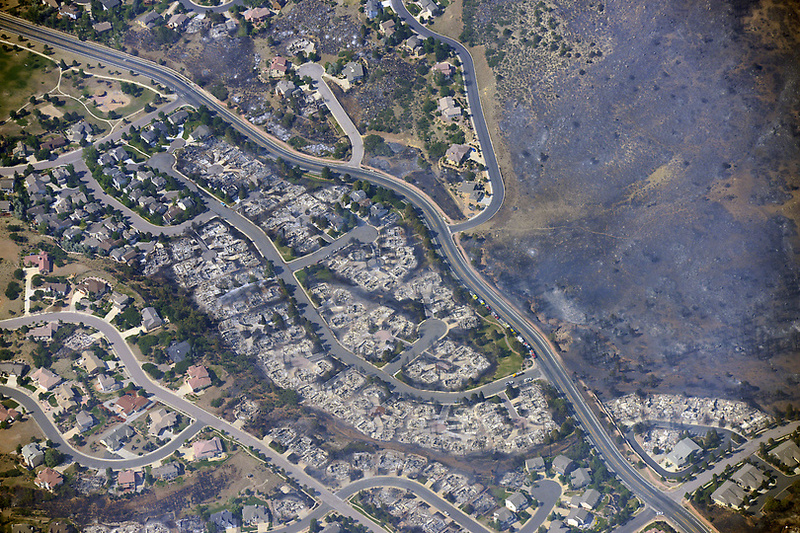 From our Ryan Handy: Sheriff Maketa has been told that the Waldo Canyon fire could last a month. Well over 800 firefighters, according to The Gazette's Kristina Iodice. It has been reported that the fire has now incurred into the U.S. Air Force Academy from the south. It is being reported on the live news conference that 32,000 people have been evacuated. No reports of any injuries at this time. 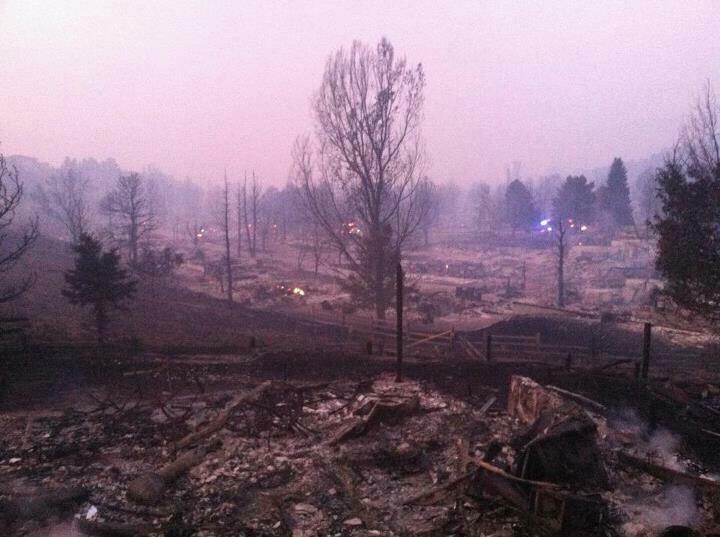 It has been reported that Flying W Ranch has "burned to the ground". This was a Colorado Springs landmark tourist attraction. HOW VERY, VERY SAD!!! 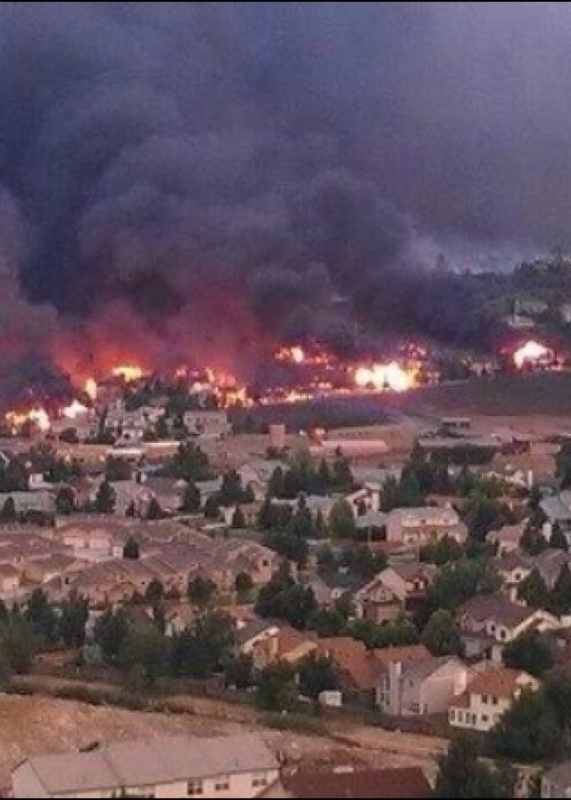 It is confirmed - multiple houses are now burning in Mountain Shadows - we are wathcing it live on KKTV-11 right now. That is about 5 miles form our house! 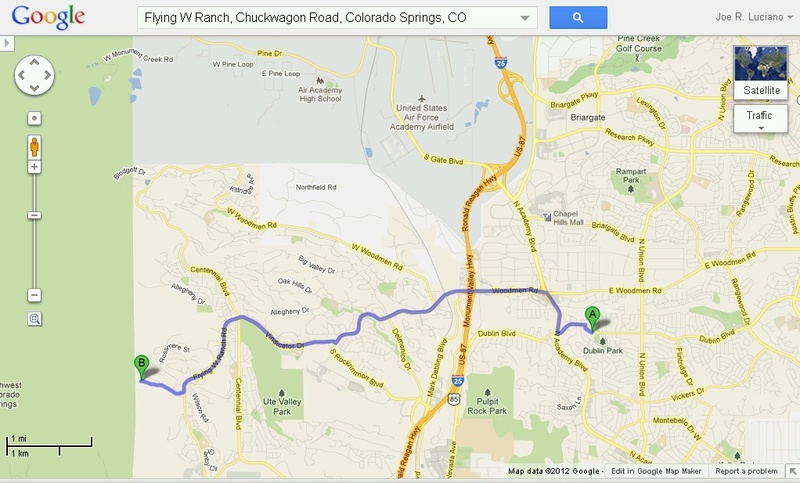 Fortunately it is west of us across I-25 which forms a somewhat north-south clear corridor between us and the fire. 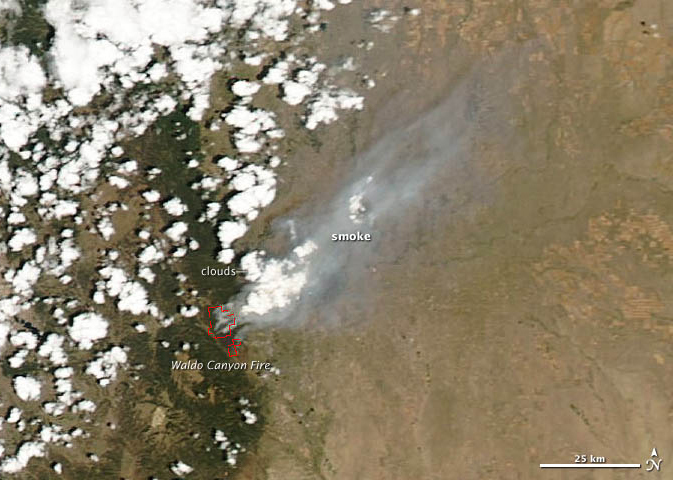 this surprise rush of the fire into a west/northwest direction was caused by a "dry storm" of 60-65 mph winds. The fire just "blew up" and ofer the ridge. Rockrimmon and Woodmen Valley, west and north of Woodmen Rd and I-25 and west and north of Rockrimmon Blvd and Vindicator Dr.
Pinon Valley and Pine Cliff, west and north of Garden of the Gods and I-25 to Centennial north to Ute Valley Park. 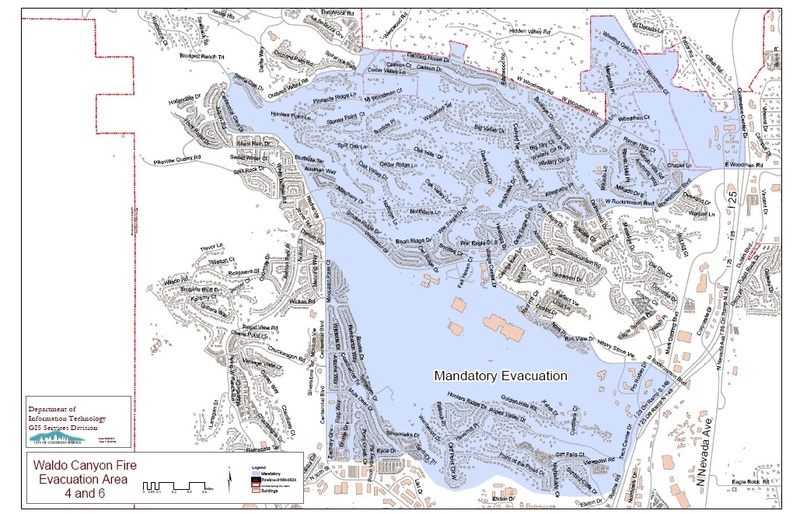 Mandatory evac order remains for all of Cedar Heights, Mountain Shadows and Peregrine. 6/26 18:28 MDT - The owner of Flying W Ranch just called KKTV-11 to rport that the Ranch is now on fire! How terribly SAD!!! The fire has broken over the ridge an is heading over the Mountain Shows and Perrigrine subdivisions towards I-25, which means it is heading towards US. 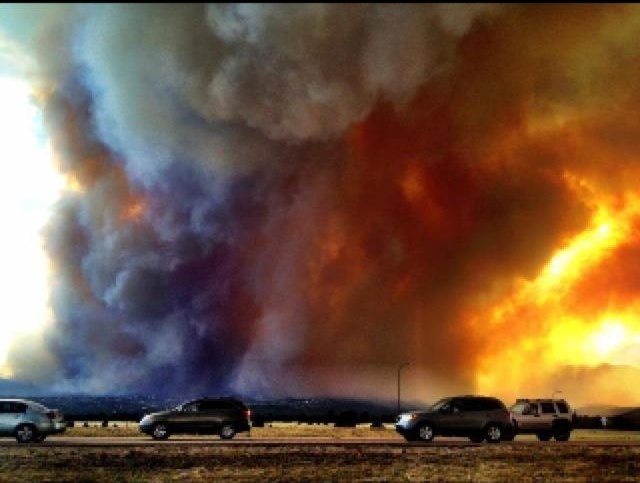 Fortunately we are about 5 miles away and have I-25 between us and the fire, but it is STILL very scary. 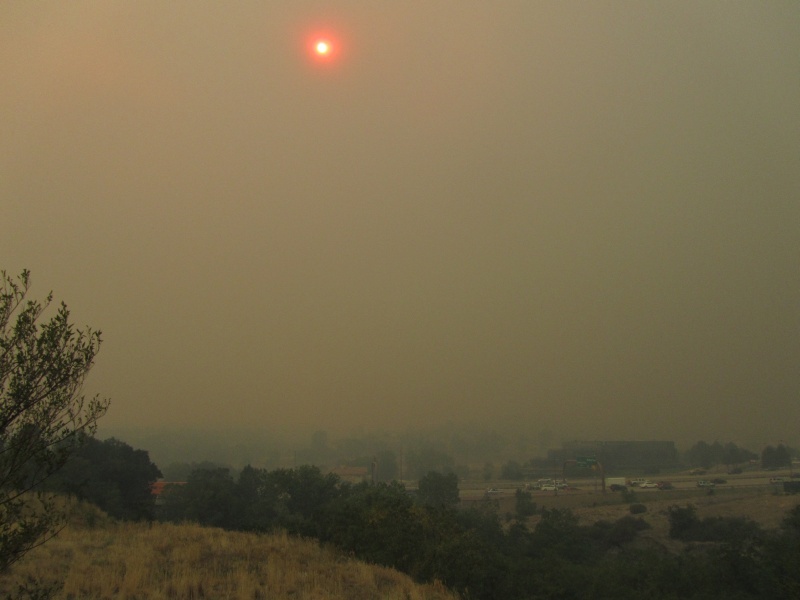 Our neighborhood is now engulfed in smoke, and the entire Front Range of mountains is tottally hidden from us in smoke. 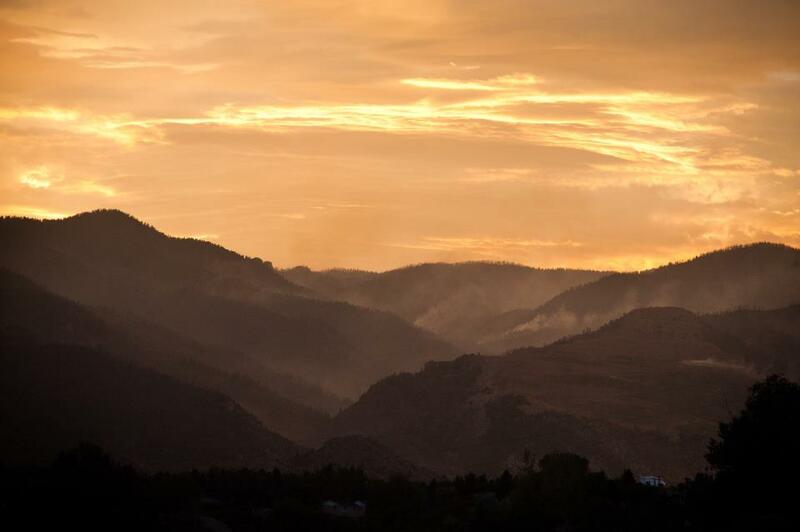 This page is intended as a central information resource for all our family and friends about the Waldo Canyon Fire now burning near Colorado Springs, Colorado. It may not be fancy or pretty, but it will have all the latest information, news, and links to other resources. I intend to update it frequently with the latest available information. So, be forewarned, the page content, layout and organization may change frequently as I add new items and update existing items, and possibly rearrange things. Refresh the page frequently in your browser to get the latest updates. The Index at the top of the page may also change frequently, but you can use it to get to any section on this page. If you find anything you think I should add or see any errors, please email me using the email link at the bottom of the page. 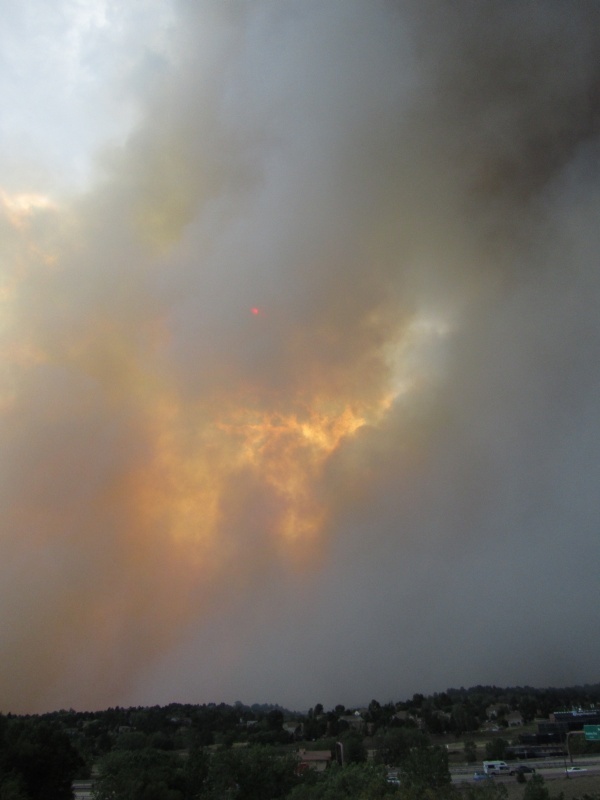 We are extremely concerned with this particular fire as Joe and Amanda's home, in Manitou Springs, is only about 2 miles from the southern flank of this fire in a densely populated and forested area. Plus, we have been having many consecutive days of 95-100+ degree temperatures with extremely low humidity (less than 10%) and NO RAIN now, or in the foreseeable future. We have been directly affected, since we had to evacuate Joe and Amanda's most valued possessions from their home on Saturday, when the fire started, and they have been staying at our house since then. They may be returning to their home this evening (Tuesday 6/26). A form on a website has been set up for evacuated residents who are concerned about the status of their home or business.